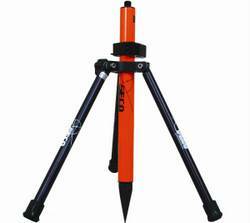 This tripod is ideal for use with poles under 24 inches long, and it's simple and easy to use! The legs are a fixed length of 12 inches each. Its universal head accepts pole diameters of 1 inch to 1 1/4 inches. Other features include stainless steel clamp screw, rubber tips for gripping hard or slick surfaces.